Apple’s sensational wireless earbuds have plenty of cheap imitators, but they’re typically not worth it. When Apple debuted the AirPods in September of 2016, everybody scoffed at the seemingly exorbitant $159 price. Since then, scores of other true wireless earbuds have been released, and it turns out that all the good ones cost that much or more. Apple was giving us a bargain, and we just didn’t realize it. Fast forward a couple years, and the AirPods still haven’t been replaced by a newer model, and still cost $159. Can you get the same experience for less? Most of these not-really-AirPods cost around $30 to $50, a fraction of what real AirPods cost. Are any of them any good? We purchased a bunch to put them to the test. Ultimately, no, none of them hold a candle to real AirPods. You get what you pay for. Any reputable company that tried to shameless rip off Apple’s unique AirPods design would immediately get sued into oblivion. So, while you’ll have no trouble finding AirPods-like earbuds at online retailers like Amazon, they almost always come from Chinese companies with sketchy reputations. We bought seven different cheap AirPods knockoffs, and most of them took 2 to 4 weeks to arrive shipped from China. One pair never shipped at all…it was perpetually in a “running late” state. Two of the others turned out to be totally identical, down to the packaging, though it wasn't obvious at the time of purchase. That leaves us with five contenders, and it turns out even among those five, two are nearly identical. That’s because all the store listings for these not-quite-AirPods are from intermediary companies that resell the earbuds, at least until they accumulate enough one-star ratings or complaints to shut down their Amazon shop and start up a new one. In the weeks it took to gather and test these, about half of the product pages completely disappeared, though I was often able to find them again on a different page with a differently-named seller. Most of the products don’t list using a real brand name, instead stuffing the product listing with as many keywords and other popular product names as possible. It’s difficult to know what you’re really going to get until it shows up at your door. Be prepared for product listings that look more like keyword vomit than product names. You can expect a lot of compromises in quality and features, too. The charging cases often don’t have a battery in them, so you have to put the earbuds in the case and plug them in (with a microUSB cable, never Lightning) to juice them up. They don't start charging when you just put them in the case; you have to press a charge button. None of them have accelerometers or proximity sensors, so they can’t detect when they’re in or out of your ears and the controls are tap-sensitive. Rather, there are always buttons on the stems that you press or double-press to pause or skip tracks. 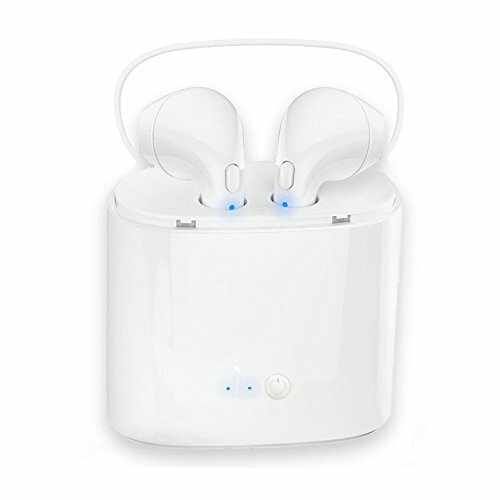 Without a proximity sensor, they can't perform neat tricks like automatically stopping playback when you take one earpiece out and resuming when you put it back in. Naturally, none of them have the easy setup process or iCloud integration with your other Apple devices that AirPods have. Nearly all AirPods knockoffs (left) are larger than the real thing (right), with bigger, heavier stems—they just don't stay put in your ears. Sound quality and Bluetooth connectivity varies wildly. I experienced everything from “sounds decent for only forty bucks” to “the music that 14-year-olds blast over Xbox live voice chat sounds better than this.” On every pair of earbuds tested, I had at least occasional Bluetooth problems, some of them quite severe and common. 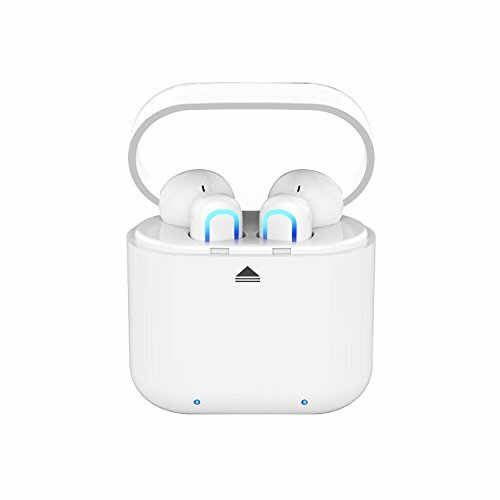 So no, you can’t get AirPods or anything like them for less than $50. But can you get true wireless earbuds that are even worth the price? Here are our opinions of the earbuds we tested. These may not have the fit and finish of AirPods, nor do they have the easy pairing and advanced sensors. You’ll have to press-and hold buttons on the stems to pair and operate them. But the case, while not finely crafted, feels more substantial than many of these other AirPod-alikes. The earpieces are relatively close in size and shape to those on Apple’s product, so they fit comfortably. The stems are thicker and heavier, which is more than just an aesthetic issue—I found the weight pulled them out of my ears if I engaged in even moderate activity. I could never go running with these. Sound quality is surprisingly good, given the cost. AirPods sound clearly better, but you get about the same dynamic range and clarity with these as you would with a cheap $30 to $40 pair of wired earbuds. Microphone quality was pretty poor when making calls, however. 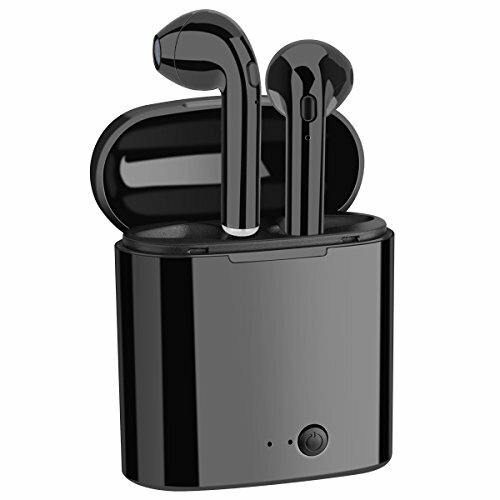 At a price of about $74, these are nearly half the cost of true AirPods, and far more expensive than many of the other AirPod-like earbuds. The shape of these come closest to true AirPods of any of the fakes we’ve tested. 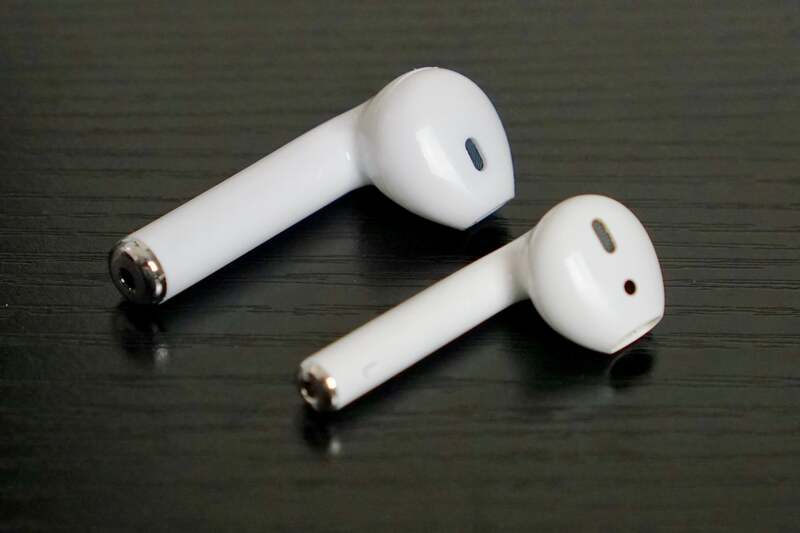 The earpieces are nearly the same shape as Apple’s, and the stems, while larger than those on the AirPods, are not quite as large and heavy as some others. As a result, they fit better than most—they’re not quite as resistant to heavy activity as real AirPods, but moving my head around a little didn’t shake them lose. Sound quality is reasonable for the price, too. There’s a bit of noise and some bad distortion at high volumes, and the bass response is underwhelming—a good pair of wired $75 headphone would sound much better. There’s a faux-leather carry pouch in the box and a nice braided (but very short) microUSB cable. Neither one are a big deal, but it’s a nice touch. Pairing worked well, and I didn’t have any serious issues with one or the other earpiece dropping out. I did lose Bluetooth connection more easily than I’d like at further ranges, but it stayed solid as long as I was within a few feet of my iPhones. The little multi-use buttons you use to turn the headphones on/off and play/pause music are really stiff and clicky. I couldn’t use them without pushing the earpiece out of my ear, and the click was painfully loud. 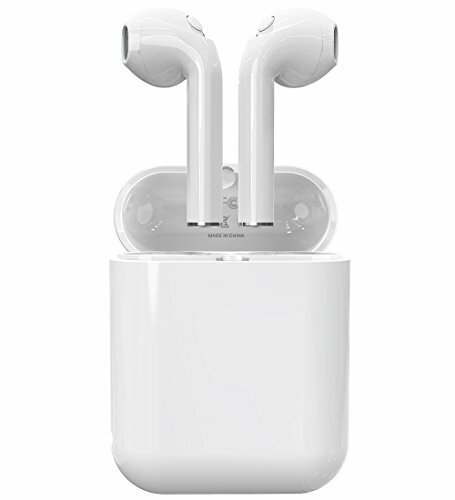 If you really must get AirPod knockoffs, these are probably the best choice, despite costing more than the other fakes. They have fewer serious drawbacks than the cheaper ones, but they’re still a long way from real AirPods. 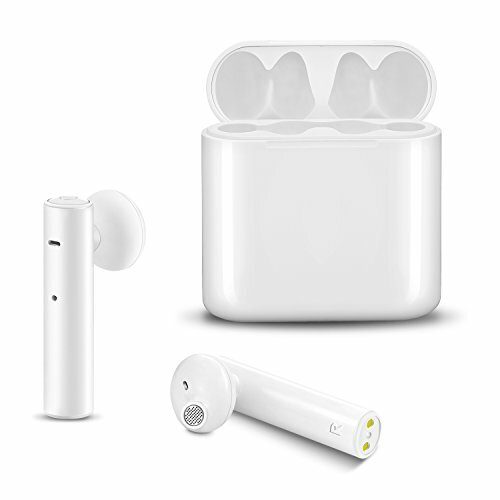 These aren't quite as cheap as some of the other AirPods knockoffs, but at around $44 or so, they're still pretty affordable. The quality is a step above most of their contemporaries, but they still suffer from obvious problems that make them hard to recommend. The earpieces are oddly-shaped, with an oddly bulbous round speaker casing and a flanged port. It’s a little hard to position properly in your ear, and doesn’t want to stay put too easily. The somewhat thick and heavy stems don’t make that any better. When sitting still, they sort-of fit, but they quickly get out of place, or fall out entirely, with activity. Pairing worked well—it’s not as effortless as true AirPods of course (none of the knockoffs are)—but the press-and-hold button instructions worked right the first time, and I didn’t lose connection frequently. That’s more than I can say for most of the other AirPods knockoffs. Construction quality is better, too. The case is sturdier and built to tighter tolerances, though not as refined as Apple’s. Interestingly, it recharges with USB-C rather than microUSB, and I had little trouble actually getting the charging to work. Unfortunately, sound quality is quite bad. There’s no bass response at all, and the mid-range and high tones aren’t as clear as they should be. Between that and the poor fit, it’s hard to give them much credit for being better-built than other cheap AirPods alternatives. These may look superficially like AirPods, but don’t let the photos throw you off. Everything about them is substantially larger—the case, the earbuds, the stems. I couldn’t get them to stay put in my ears. The charging case feels chintzy and cheap, and is easily twice the size of the AirPods case. Like most AirPod replicas, these don’t have the accelerometers or sensors to make them tap-able or automatically pause playback when you take one out of your ear. I had a really tough time getting them to stay paired to my iPhone. One earpiece or the other would frequently disconnect, or simply drop sound for a few seconds. When they did work, the sound quality was terrible; tinny, thin, and distant. Definitely worse than most cheap $30 wired headphones. What a mess. Before even stuck these in my ears, I hated them. I had trouble pairing them, with my phone. I had trouble pairing them with each other. The included instructions are poorly translated into English, but even after I figured out what I’m supposed to do, Bluetooth pairing simply didn’t want to work. It took half a dozen tries to get a solid connection. The earbuds are far too large and would constantly fall out of my ears—not just during activity, but immediately upon insertion. I had to continuously hold them into my ears with my hands. Music playback sounds terrible. Tinny, thin, distant, and quiet. There’s no bass response. The left ear kept dropping out for no reason (I tried re-pairing it quite a few times). I’m not even sure the charging case works. The light that is supposed to indicate charging never came on, even after several attempts at pressing the charge button, re-seating the headphones inside, leaving it plugged in for prolonged periods, you name it. Oh, and these earbuds came with little rubberized slip-on wingtips, which would be a nice touch if they fit. They were really hard to get on, and the hole on the side didn’t line up with the speaker grill on the side of the earpiece.